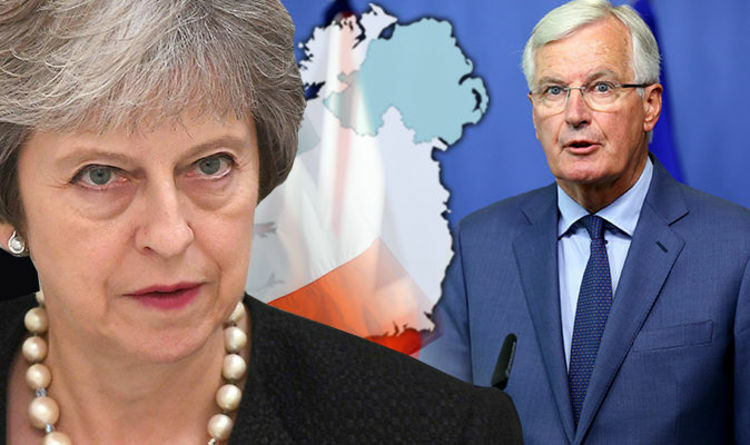 Frenchman Mr Barnier has announced he is ready to make the first move in concluding gruelling talks on the Irish backstop that have plagued Brexit negotiations since the June 2016 referendum. He claimed the block is “ready to improve” its Irish border proposal before warning the October EU summit will be the “moment of truth” for Brexit negotiations. He later added any future deal would see a “set of technical checks and controls”. He said: “Of course, we have to make headway decisively on the Irish question. The proposal for the backstop on Ireland and Northern Ireland has been on the table since February. “It is an insurance policy to avoid a hard-border between Ireland and Northern Ireland, whatever the future relationship may bring. “It reflects our agreement with the UK on December 17, confirmed by Prime Minister Theresa May in her letter to President Tusk in her letter in March. The shock news comes hours before Prime Minister Theresa May is set to make a fresh plea to EU leaders for compromise over Brexit at a crunch summit in the Austrian city of Salzburg today. At today’s summit, Mrs May will brief her EU counterparts on her controversial Chequers plan which could spark a leadership challenge at the looming Conservative Party conference in 11 days time. See below for our coverage of Brexit news throughout the day. Expanding on last night’s comments Mr Barnier last night said: “We are ready to improve this proposal. Work on the EU’s side is ongoing. We are clarifying which goods are arriving in Northern Ireland from the rest of the UK would need to be checked and where, when and by whom these checks could be performed. “We can also clarify that most checks can take place away from the border at the company premises or in the markets. “We need to de-dramatise the checks that are needed. These checks are caused by the UK’s decision to leave the EU, its single market and the customs union. “What we need in the Withdrawal Agreement, is a legally operational backstop which fully respects the territorial integrity of the UK. Theresa May has said Brexit will give Britain the “freedom to deliver the British dream”. In an exclusive interview with the Daily Express, the Prime Minister delivered her most optimistic vision yet of how breaking free of Brussels will benefit the whole the country. Theresa May issued stark warning that demands for a second EU referendum risks shattering trust in Westminster. She said: “We gave people the opportunity to make a choice. They made that choice. Her remarks come after relentless campaigners for a second EU referendum have set out a roadmap to obtain a “People’s Vote” giving the public the final say on the outcome of Brexit negotiations. In a report published as Mrs May made her way to Salzburg for today’s EU summit it suggested suggested the Prime Minister could be forced to concede a second referendum by a vote of MPs in Parliament. The document also insisted the option of remaining in the EU “must be on the ballot paper”.